The Champ's 4"x4" 11 ga. steel post is 50% heavier than any goal of its kind. Our one piece post design eliminates wobbling, rusting joints common with sectional type posts. Our Insta-Just� height adjustment mechanism allows the Champ to adjust from 10' to 7'6" in six inch increments. To adjust, use a broom handle to release the Insta-Just� height regulator. 18" backboard to post extension. 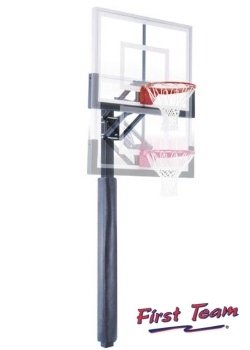 A variety of backboards and rims are offered with the Champ so you can choose the Champ package that's right for you. For additional safety, pole padding and backboard padding can be added to any Champ package. Every Champ package comes with a Lifetime Limited Warranty.